Summary: A bold, heartfelt tale of life at Green Gables . . . before Anne: A marvelously entertaining and moving historical novel, set in rural Prince Edward Island in the nineteenth century, that imagines the young life of spinster Marilla Cuthbert, and the choices that will open her life to the possibility of heartbreak—and unimaginable greatness. There was quite a bit of buzz at this year's Book Expo for MARILLA OF GREEN GABLES by Sarah McCoy. I met Sarah a few years ago and I am a huge fan of her books (and basically Sarah too -- she's delightful!) But I admit that I was a bit hesitant to read a prequel to ANNE OF GREEN GABLES. I read ANNE for the first time earlier this year ( I know - it's hard to believe), and I absolutely loved the book. So it begged the question, "Would a prequel live up to this classic novel?" I am happy to say that it did. I loved MARILLA OF GREEN GABLES! I never should have doubted Sarah -- she's a terrific writer, and her novel is definitely "ANNE - worthy." This book had the same feel as ANNE OF GREEN GABLES, and I fell in love with Marilla, Green Gables, and the other characters. It was absolutely charming and heartwarming and all those other words that basically mean I just loved this book! 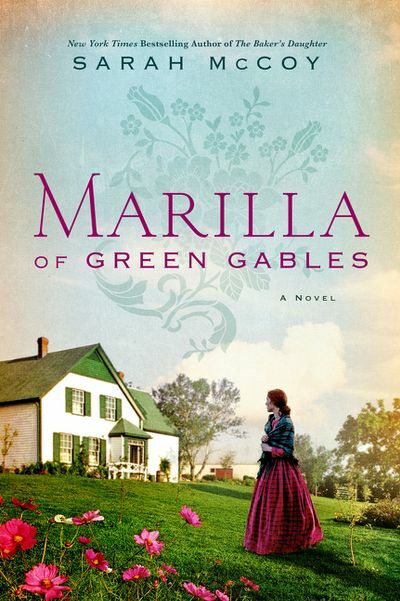 MARILLA OF GREEN GABLES tells the story of Marilla Cuthbert. The novel begins when Marilla was thirteen years old and living in Avonlea. She meets her Aunt Izzy, who is quite a character and definitely a woman ahead of her time; and she gives Marilla an idea of what life can be outside of her small world! Despite losing her mother at any early age, Marilla makes the best of her situation. She ventures outside of her farm life (making new friends and falling for a guy), and and begins doing charitable works for others. She even becomes involved in an orphanage that acts as a station for runaway slaves from America. Marilla is selfless and kind, and her involvement in politics and abolition help to create the woman we meet in ANNE OF GREEN GABLES. I found MARILLA OF GREEN GABLES to be such a beautiful work of fiction. The author brought Green Gables and its characters to life, and it was so fun to see who they were before Anne changed their lives forever (in the very best way!) I especially appreciated Marilla's romance with John Blythe. While it didn't end exactly the way I wanted (no surprise there! ), it really helped explain how Marilla turned out to be a spinster and living with her brother. Fans of ANNE OF GREEN GABLES will love this book -- I promise! However, I also think anyone who loves a heartwarming story about a woman discovering herself will enjoy it too. Highly recommended! Thanks to the publisher for providing a copy at this year's Book Expo. I thought this book stayed true to the spirit of Anne of Green Gables and found it to be very charming.